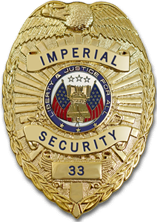 Imperial Security is one of the largest security companies, with branches from coast to coast. Established in 1968, Imperial specializes in contract security guard service in St. Louis and surrounding areas. Imperial Security provides highly trained security guards for the distribution, transportation, logistics, high technology, manufacturing, petrochemical, commercial real estate, hospitality, and healthcare industries.